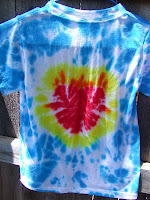 We love decorating T-shirts around here! Remember the tulip tees? Or our traditional 4th of July tees? 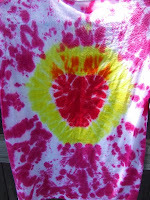 Well, when I bookmarked this craft idea, which I think came from Jessica's Summer with the Saints post from last year, I knew that summer time would be the perfect time for trying on some tie-dye! 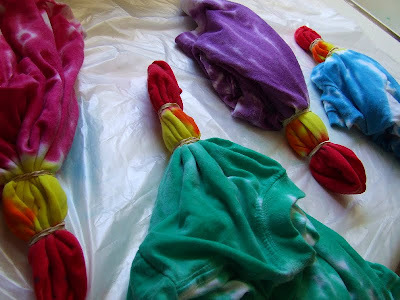 Now, I've never tie-dyed before and we didn't have the kits that were mentioned in that post, but following this tutorial and using a kit like one of these Tulip One-Step Tie Dye Kits from Hobby Lobby made it super easy. As you can see, we used a little creative license and didn't make ours exactly the way they look in that Little Flower craft. When they are dry, I will add the encircling thorns and the cross with a Sharpie marker. Don't forget, the Solemnity of the Sacred Heart of Jesus is coming up next Friday. I also plan on making a Sacred Heart Cheesecake again and hanging our beautiful Sacred Heart prayer card holder on the wall. 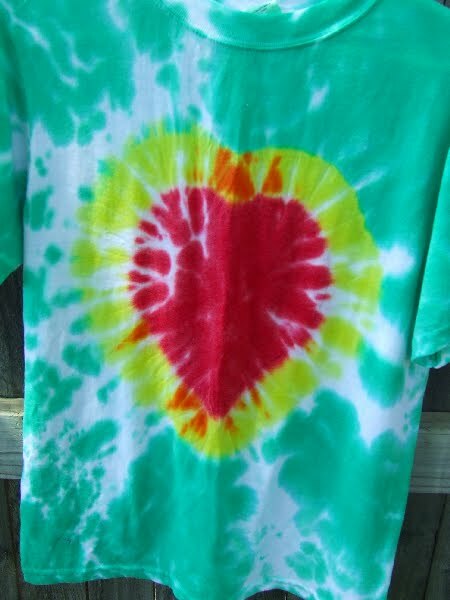 P. S. A while ago, a friend told me about another T-shirt idea that I just have to try but I'll save that for later! Those turned out beautiful!!! I've always used the powders for tye-dying! I can't wait to try these! I will Jamie! 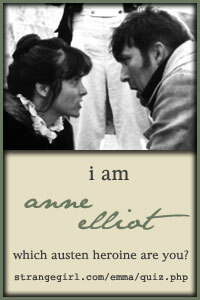 If you look at the picture in the post I linked to you can see the encircling thorns. Also, Jamie, the kits came with powders that you mixed up in a bottle they provided so it was still a little messy. We used some orange dye to create our own flames effect which was a potential disaster since we couldn't really tell where the orange was going. 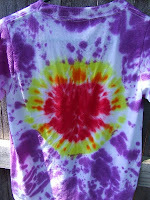 I've never attempted to tie-die and you made it look awesome! I noticed the orange "flames"! REally neat ~ thanks for sharing. Fabulous! I think I'm heading to Hobby Lobby tomorrow! Charlotte these are just awesome. I love yours and linked shirts. I hope we can do these sometime. Very fun! I'm so excited to see these! I also found the little flowers craft, and was blown away by such an adorable idea! We made some shirts on Wednesday and are putting the finishing touches on this weekend. It's so great to see some more completed shirts! Your flames are amazing! I didn't attempt to get them in the "right" place. I just kinda let the orange bleed together around the entire heart. Very creative! I love it! 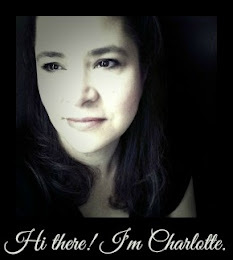 :-) Thanks for sharing, Charlotte! Those are incredible! 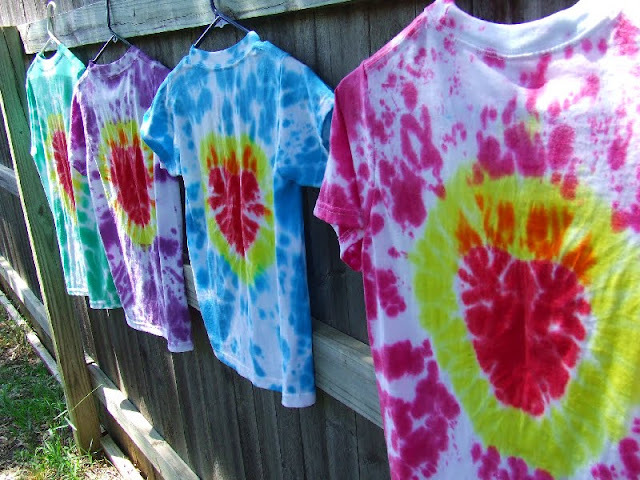 I thought they looked like Sacred Heart shirts before I even read your post. 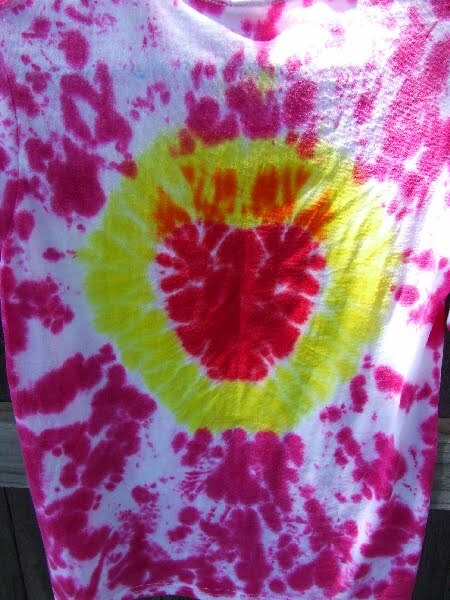 I guess we're going to do some tie-dying! Those are really spectacular, Charlotte! Very cool!